Importantly, a loss of jawbone inevitably follows tooth loss. In just the first year of tooth loss, there is a 25% decrease in bone width. This is followed over the next few years by an overall 4 millimeters decrease in height. If enough teeth are lost, and as bone loss continues, the distance from nose to chin can decrease and the lower third of the face partially collapses. 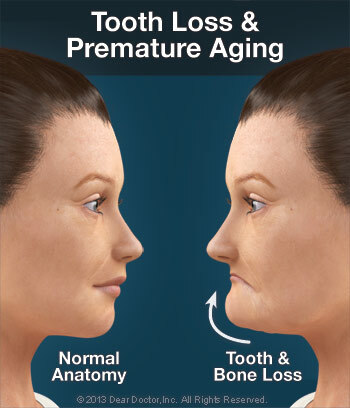 With a lack of structural support, the lips sag; that's why toothless people often appear unhappy and prematurely aged. Also, extreme loss of bone can make an individual more prone to jaw fractures. Besides helping a person without teeth look and feel great again, dental implants actually prevent bone loss. That's because they are made of titanium, which has a unique ability to fuse to living bone. By actually becoming a permanent part of the jawbone, dental implants stabilize and stimulate the bone to maintain its volume and density. Learn more about tooth loss and premature aging. Other than dental implants, your tooth-replacement options include fixed bridgework that incorporates or uses the adjacent teeth, and removable dentures. You should be aware, however, that the disadvantage of these options is that they may damage the anatomical structures on which they rest. Removable full dentures present the greatest risk to your health of any tooth-replacement option as they press on the bony ridges that used to support the teeth, accelerating the bone loss that began when the teeth were lost in the first place. Removable dentures and bridgework using natural teeth are both less expensive than dental implants, but only when viewed in the short term. Since dentures and bridgework may cause new problems and will likely need replacement themselves, they don't offer the same long-term value. When viewed as an enduring investment in your comfort, health and well-being, implants offer the best return by far. Learn more about the dangers of removable dentures. There is another option you may be considering: not to replace your missing teeth, at least not right away. This is not something we would recommend. In fact, the quicker you act to replace missing teeth, the less expensive the procedure will be. That's largely due to the inevitable bone loss that follows tooth loss as described above. As discussed, dental implants are your best option for replacing missing teeth in appropriate circumstances. However, if your tooth-supporting bone has begun to degenerate, there may be problems that need to be addressed before your implants are placed. For example, the bone may have shrunk down so much that the nerve running through it is now too close to the surface to risk placing an implant in the ideal location without first building up the bone volume there. This would require a bone-grafting procedure, which is quite routine these days but adds cost and time to the treatment plan. Certain situations involving bone loss could require additional implants to be used. So it's best to act sooner rather than later to get back your smile. Learn more about the cost of not replacing missing teeth.